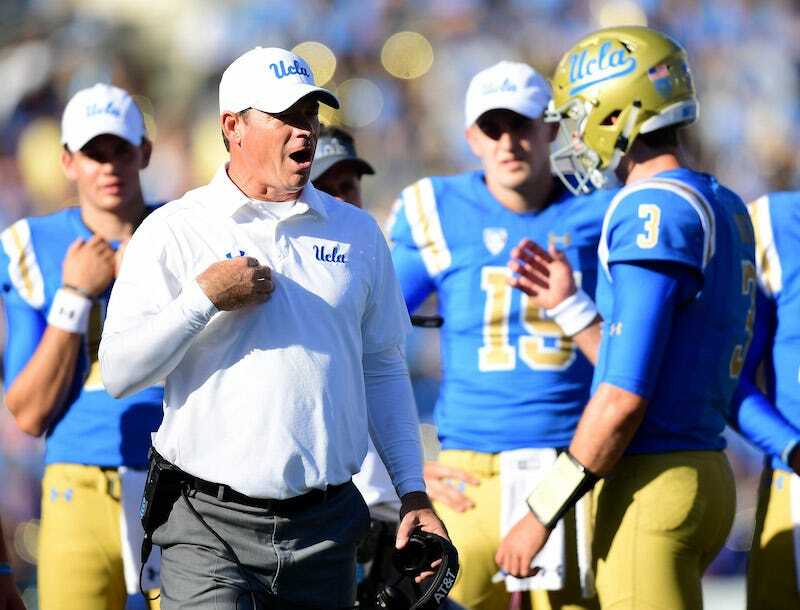 What Jim Mora Means When He Describes Josh Rosen As "A Millennial"
“He needs to be challenged intellectually so he doesn’t get bored,” Mora told Sports Illustrated’s Peter King for today’s The MMQB column. King had asked Mora to explain why he thinks the Cleveland Browns ought to draft Sam Darnold of rival USC No. 1 overall ahead of Rosen, whom Mora coached at UCLA before he was fired last November. So what’s the issue? King wrote that Mora kept emphasizing something about Darnold’s potential “fit” with the Browns, which Mora characterized as “the underdog mentality that I think will fit so well in Cleveland, a franchise that’s really been down.” UCLA went 10-15 during Rosen’s final two seasons. It would seem that Rosen became well acquainted with being down while playing for football teams coached by Jim Mora. Mora has done this before. Two years ago, he told SI’s Albert Breer that Rosen’s “maturity” was still an open question, and that Rosen “[j]ust needs to continue to grow and not think he’s arrived.” In Fusty Old Football Man parlance, this is blunt talk; Rosen is famously opinionated with a mind that’s capable of thinking about something other than deciphering a Cover 2 defense. To Fusty Old Football Men like Jim Mora, this is problematic. By reaching for a word like “millennial,” he’s telling on himself. “He’s a challenging guy to coach because his aptitude is so significant. He’s a tremendous player as far as coming every day ready to work and ready and willing to learn. That pulls the best out of you as a coach because you can’t go into the meeting room and not challenge this guy to try and get better. Mora has thus revealed one of two things: 1) He really doesn’t want Josh Rosen to wind up in Cleveland; or 2) He didn’t have the first clue how to coach Josh Rosen. Jim Mora: "I Would Take Sam Darnold If I Were The Browns"